V12 Vantage S - Extreme sports. The V12 Vantage was an unprecedented engineering achievement. Combining a V12 engine with our lightest sports-car in a package of pure aggression. We could have stopped there, we didnt. An even lighter chassis, an even more powerful engine, an even more responsive transmission. V12 Vantage S the most ferocious Aston Martin ever produced. An advanced engineering story told by monumental numbers. 15kg lighter than V12 Vantage. 573PS of power. 620Nm of peak torque. With enhanced low and mid-range power the new-generation AM28 engine pushes the V12 Vantage S to a top speed of 205mph, creating the fastest series production model weve ever made. Sportshift III, a new seven-speed AMT transaxle gearbox specifically designed to tap the potency of V12 Vantage S. Seamless gear changes at high engine speeds. Advanced light-touch paddleshifts giving maximum driver control as both hands remain on the wheel. A transmission derived from the Vantage GT programme brings motorsport engineering and race-car capability to the road. 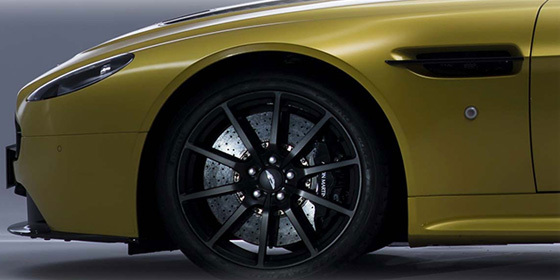 The controlled power of V12 Vantage S comes with revolutionary levels of response to driver input. Three-stage adaptive damping. All new carbon ceramic brakes. A unique track-mode with delayed anti-lock braking technology. This isnt technology to aid the driver, its technology that puts the driver in control. Extreme performance. Extreme styling. A bold new carbon fibre grille marries design and engineering to improve airflow whilst defining a more aggressive front profile. New roof and rear graphics packs. Lightweight forged alloy wheels. All new interior finishes on seats, doors and controls. Never opulent but always dramatic the V12 Vantage S is tailored for a visceral driving experience. Unprecedented performance levels from world-class engineering. 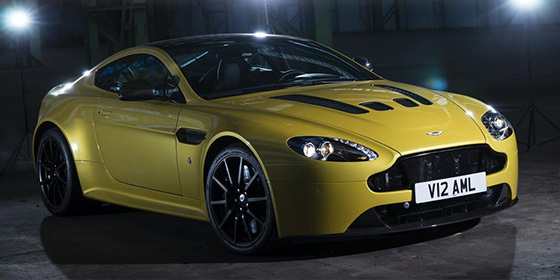 V12 Vantage S produces extraordinary figures. 573PS, 11% more than V12 Vantage, 620Nm of torque, a 9% increase, combined with a weight saving of 15kg 'power to weight' increases by more than 10%. One final figure 205mph V12 Vantage S powers to the title of the quickest production Aston Martin in history. Our engineers set out to create a car that delivered you accessible performance and more excitement - whatever the conditions. New technology. Innovative, patented solutions. World-class partners. They came together to create a car like no other, a car youll love driving. The new-generation AM28 V12 engine delivers exceptional performance. Integrated with our Gen4 VH architecture this combination drives peak power to 565bhp and a phenomenal top speed of 205mph. An advanced engine management system controls AM28 alongside the debut of Dual Variable Camshaft Timing and knock-sensing - all improving efficiency and engine capability. Gen4 VH architecture, the latest evolution of our world-renowned and admired construction philosophy. Lightweight aluminium is joined with epoxy resin used in aerospace engineering. Gen4 - specifically engineered for V12 Vantage S - is more rigid than ever before. Holding the all new AM28 engine within the smallest Aston Martin chassis, our VH architecture has delivered again - flexibility, performance, the core to a pure driving experience. The AM28 engine increases peak power to 565bhp, but alongside this is instantly accessible torque throughout the rev range. Even at 1000rpm there is an additional 70Nm of torque compared to our previous model. Increased acceleration throughout the gears means a consistent performance graph. V12 Vantage S doesnt just peak, V12 Vantage S gets ahead and stays ahead.